i own two of the exact same sweater. well, i should really say that i bought two of the exact same sweater. i still own both of them but they are quite different at this point. the sweater i speak of is actually the pink/coral colored one pictured in my first ever fashion post from almost a year ago. at 29.5 i decided to start caring about how i present myself and what my style says about me and how it can affect my day to day emotional well-being. that sweater and ombre tank top combo have for almost an entire year held the place of my security blanket outfit. whenever i am having a self esteem spiral or "can't find anything to wear!" i can always count on that duo to bring me through and just make me feel good until i climb down off the ledge. so imagine my horror when last summer i got my sweater out of the dryer to find that it had faded oh so badly. it was at best a diluted imitation of its original color, and at worst a pastel salmon monstrosity. i am not very good at laundry. i always buy the biggest, cheapest detergent there is, dump a ton of it in the washer and run everything on warm. *(we haven't dry cleaned one piece of clothing in over 6 years of marriage and if a tag says "dry clean only" i read it as, "DO NOT BUY THIS KEIGHT." the few times that i have ignored my own tendencies and bought a dry clean only garment have ended with me wearing it until the stains or pit-smells make it unwearable and then putting it on top of my dryer for about 2 years. then i take it down, smell it and usually 700 days of sitting there have knocked all of the smelliness out of it and i start the cycle again. i agonized over buying a duplicate replacement sweater and finally decided it was worth it. the day i paid for the same sweater for a SECOND time, everything changed. the death of a garment changed me, y'all. since then i wash everything i care about on the delicate cycle and in cold water. i don't know if this is right exactly, but i've been burned and traumatized (overstatement?) by losing things i love and have spent money on, just to have them fade or become permanently stained after a few washings. the one thing that i didn't change was my detergent. i am frugal to the max and just kept buying the 50-gallon (exaggeration) containers of the no-name stuff. 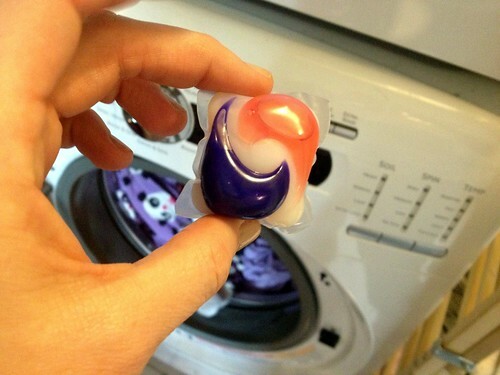 so when Tide offered me a chance to try their 3-in-1 detergent Tide Pods, i accepted, thinking that surely a little nugget of goodness couldn't really be that much better. best believe some of the syrup glistening on that bear plate made it onto little clothes. first off: the ease of the Tide Pods is seriously wunderbar. if you recall, our washer/dryer are stacked. this is awesome for the most part, but since our detergent lives atop the dryer, it's kind of a pain to reach up there on my tippy toes and then go through the rigmarole of filling up the cup with the messy liquid stuff (which inevitably drips down onto the pantry floor and pushes me closer to the grave when i see that slimy goop). so being able to just grab a pac from the bag and toss it in really had a benefit that i didn't expect. okay so then there is the triple chamber design of the Tide Pods that promises to clean, brighten and fight stains better than 6 caps of the liquid stuff (based on stain removal performance of one pac of Tide Pods vs. 6 doses of the leading liquid bargain brand base variant in a standard top loading machine.) here's where i was skeptical. BUT in the interest of a seriously honest review, i decided to trust the promise. so i grabbed a bunch of my most vibrantly-colored pieces of clothing out of the dirty clothes, checked them for smelliness (check! my social anxiety manifests as charming pit-moisture) and stains (double check! i am a vigorous eater and sometimes there be shrapnel) and put them all in one load. i threw in a pac (so much squishier than i had expected), crossed myself (not really though) and set the washer on the regular color cycle rather than delicates. i am thrilled to say that my ruby cardigan is still ruby. not only are the colors just as bright as when i bought them, but the stains came out completely, which was really surprising given the tiny pac versus the huge cup of liquid i usually use (which still wasn't getting stains out effectively). i also kept detecting the most pleasant smell. i kept looking around for a charmingly beautiful and nice rich lady who was fresh from a mountain glade. i eventually realized this smell was coming from ME! the scent the pacs imparted to my clothes is so nice and it has staying power. i think this is the beginning of a beautiful love affair between our stinky laundry and Tide Pods. so what have i learned? machine washable fashion is the only way i roll and Tide's 3-in-1 detergent pacs, the only 3-chamber unit dose on the market, are the easier and more efficient way to keep my style fresh and bright. 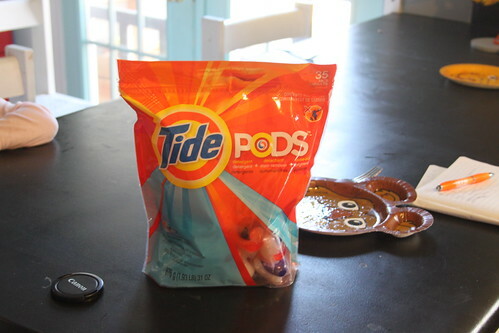 pop in a whole new kind of clean with Tide Pods. with spring around the corner (at least in schizo georgia where we are sure to get a 75 degree day in february and at least one 30 degree day in april) i put together a little 3-in-1 fashion magic of my own, showing how i would take just two affordable, machine-washable pieces and create three fresh spring looks. 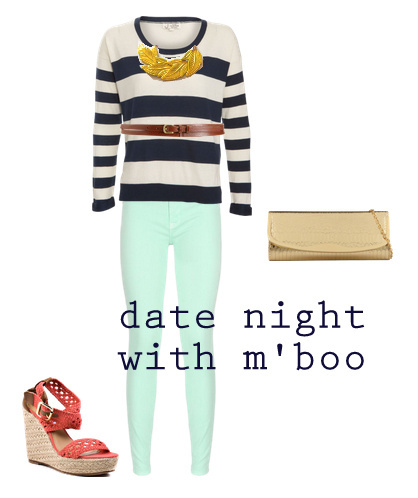 so yeah, i'm pumped that mint, yellow, navy and coral are an on-trend combo in the 2k13 and plan to rock it every which way. Tide is giving one of you a chance to beef up your wardrobe for spring with $100!! *giveaway now closed! Jessica To is our winner! My most versatile wardrobe item is my black velvet skinny jeans. I can wear them to work with flats and a silky top and look put together, all the while enjoying the comfort of jeans with a bit of spandex! Woot. Mine's a sundress. It's a leeeeetle on the shorter side (but not skanky short). In the winter, I wear it with jeans under it and a cardigan over it. In the summer, it's rocked out with my albino white legs and some accessories. Love it! Hi Keight! My most versatile clothing item is a black V neck shirt. I can wear it on it's own with jeans, with a lacey cami under it for a more conservative look. Paired with any number of my scarfs from my stash, statement necklace, under a blazer.... the list could go on and on! It goes great with jeans, slacks, or even over a dress! My most versatile would be a dark blue tunic I've had for years. I can wear it with everyday jeans or over any colored leggings. My very favorite, most versatile item is my back & white striped cardigan/light wrap sweater. I can wear it as outerwear on warmer spring days, chillier early fall days,or when I need a little post-baby belly concealment. I'm a Wyoming girl and jeans do the trick! Go with everything else in my wardrobe; especially all my boots! A cute blazer I feel can go over a dress, with jeans, and with dress pants! My tan cardigan is very versatile. It can be worn with jeans, dress pants or a skirt and different shoes that coordinate each look. I have a cute black dress that I can make dressy or wear with flats to be casual and it is a comfy. Lovin' your pod post--how is that you can make even stinky mundane laundry hilarious. Genius! I'm so in love with my black versatility sweater right now. It flatters t-shirts, tunics and me. Can be worn casual, office and church...best purchase of this season. For me it’s a classic button down white shirt, it goes with skirts, suits and instantly classes up my favorite jeans, it can be worn alone or layered under a cardi or jacket, that’s definitely 3-in-1 action right there! my dark leather jacket- works with any outfit- any skirt and any color! Blogger ate my 1st comment, I think. My black Converse Chucks! Seriously. My printed tank top can be dressed down in the summertime with shorts or dressed up for work with a cardigan and a skirt. I have also paired it with skinny jeans and a zip up for a more casual look. I have a black dress that I can wear with leggings, jeans, or by itself. my black flower leggings. I love them, I can create any look with them. I can wear a t-shirt or tank top with them, a long sweater dress, a denim shirt. I can wear boots, sandals or pumps with them. They look good with anything. My most versatile wardrobe staple is a black 3/4 length cardigan. 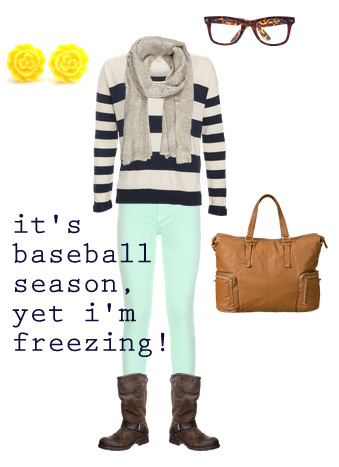 I can wear it year round with dresses, jeans, and everything in between. Thanks for the chance to win! I have a timeless, season-less dress that I love to dress up for dates with the hubs with heels and a glittery belt at waist, or dress down with sandals and a contrasting tank underneath (it has a bit of a low neckline), or wear to work with a black camisole underneath, tights, and a cardigan. Bam- 3-in-1! I love my silver glitter TOMS. They are great for running errands on the weekends, a night out, or even wearing to work. Black pants and a white blouse. I can dress them up or down or pair with other clothing. A basic navy blazer can be dressed up or down to suit almost any occasion. I have a gray sundress I wear year round and is my ultimate comfort go to! My jeans, I can dress them up, down, or wear them to do yard work. My most versatile clothing item is a pair of nice jeans and a white v-neck tee. $10 cheapo red striped dress from Old Navy. Looks great with leggings, just as a dress, or as a striped skirt with a black top belted over it. My most versatile clothing item would be my open cardigans. They can look dressy or casual. I also love that I can throw them on over my "mommy's been home all day" t-shirts and look like I actually put some thought into clothing for the day! LOL...I couldn't agree more. I haven't buy a piece of clothing that says "dry clean only" for ages! That just saves me lots of money. I have a 3-in-1 evening gown in my wardrobe that's versatile and provides 3-in-1 style. I love it. New style to parties without buying new dress every time. How awesome is that? My most versatile piece is a gray 'weekend wear' sweatshirt from J. Crew. I saw it, fainted at the price, but knew I'd wear it every day if given the chance. And wear it I have! It's cute enough (i know its a sweatshirt, but its a GOOD one) to be snazzed up with a button down, and also serves as my go to lounging shirt. I have a pair of black jeans that I wear with almost anything. My sequined sandels match every outfit I have. Love my black matte boot cut yoga pants – I can dress them up with a sparkly top, heels and jewelry and it’s out to dinner; a blazer, shirt and boots and it’s daywear; a tee and tennies and it’s sporty. My thin red cashmere sweater goes with jeans, nice pants or a skirt. I have many versatile blouses, I layer them with tank tops and sweaters, pair with jeans, shorts, or leggings, and scarf and necklace depends on weather. My fave go-to pieces are white capri's. I live in south Florida and wear them all year, dressed up or down with tops, shoes and accessories. I love this long black skirt of mine. I wear it all year long. Comfy and functional. I wear it to church, out with friends or just because. My jewelry is my biggest style maker. I can go from earthy hippie to modern artist to sparkly night out just by changing my necklace and earrings!